Years ago, I discovered my daughter loved snow globes. When I travel, and I travel a lot, I like to give my daughter snow globes from the various cities to which I travel. As the years went on, this became a bit more difficult as airports cracked down on the amount of liquid you could bring through security. But over the years, I was able to bring home a globe from most major cities around the country. For a time, she used to place them all on her bureau in her bedroom. Some are still there but as the collection grew, some had to be placed in boxes. 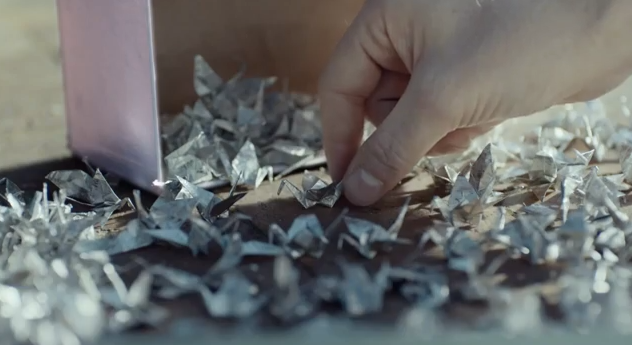 While my daughter is still quite a few years away from college, I can identify with the emotion the father in this Wrigley Extra Gum commercial experiences as he sends his daughter off to college and discovers she has saved every origami creature he made for her (out of gum wrappers) over the years. Of course, my daughter would need a crate or two to take all her snow globes to college but I'd like to think that one day I, too, will have the experience that is shared in this BBDO Chicago-created commercial. It's definitely a heart string tugger. The campaign aims to stem category losses that began in 2009 with Wrigley losing 5.54% in the last year as kids gravitated to energy drinks and chocolate.